You’ll find an impressive list of 55+ communities in Charleston, SC to meet a growing demand from home buyers. Ranked as a top place to retire by AARP, Charleston appeals to retirees for many reasons. The history and culture of this 300 year-old port city are unmatched in the South, and each year brings an array of festivals and other events ranging from the arts to professional tennis, wildlife, food, and wine. Three beaches are open to the public, and a mild climate allows residents to enjoy the outdoors year-round. Twenty-two public and private golf courses can be found throughout the tri-county area. Charleston boasts a wide range of medical and specialist centers including the Medical University of South Carolina. 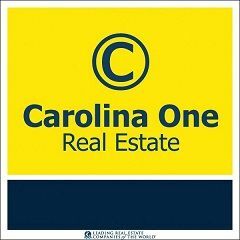 Plus, South Carolina’s relatively low property and income taxes combine with Charleston’s moderate cost of living to help make your retirement income last longer. We’ve worked with numerous retirees (and soon-to-be retired buyers) from around the country to find the perfect home in their budget. We also know the 55+ new construction options in case you want to build a home from the ground up and be able to select all the colors and finishes. We’ve included below the 55 and over communities in Charleston (most are located in Summerville). Del Webb has a new location that is part of the 4,000 acre Nexton development. This mixed use community combines residential and commercial spaces just off I-26 in Summerville. Del Webb Nexton is conveniently located just 5 minutes from the shopping, restaurants, and movie theater in Summerville. Historic Downtown Summerville is about a 10 minute drive, and Downtown Charleston is about 30 minutes. Amenities include indoor and outdoor pools, tennis and pickleball courts, an impressive fitness center, and many clubs and other social groups for residents to join. Right now, you’ll find a great selection of new construction homes at Del Webb Nexton. Plans range from 2 to 5 bedrooms with square footages from 1,262 to 3,104. Whether you’re looking to downsize or to accommodate guests/family in town, buyers can tailor their home to match their needs! Del Webb started this gated community in 2007 and has since built 1,000 homes. There is no new construction currently taking place (so all of these listings below are resales). 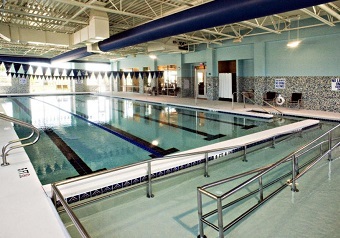 Made up of 360 acres, Del Webb has included the most sought after amenities for a 55 plus community: a heated indoor swimming pool (pictured), a separate heated outdoor pool, fitness center, dog park, a 20,000 square foot clubhouse with recreation area, arts and crafts room, and social clubs. You’ll also find tennis, bocce, and pickleball courts. Del Webb is located within Cane Bay Plantation and is 25 miles northwest of Charleston in the small, historic town of Summerville. Charleston’s International Airport is only 20 minutes away. Del Webb homes for sale range from 1,109 to 2,722 square feet. Floor plans offer 1-4 bedrooms, 1.5-4 baths, and attached garages. 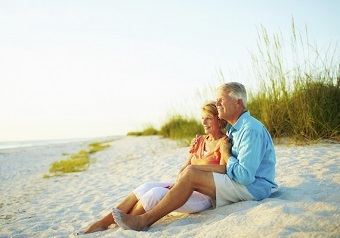 Also located within Cane Bay is a second 55+ community called Four Seasons at the Lakes. The focal point here is a 300-acre lake system that features an 8-mile blue way. You’ll find both new construction homes and resales, and the neighborhood will have about 800 homes when it’s finished. Amenities include an indoor pool, 2 outdoor pools with zero entry, a 20,000 square foot club house, fitness center, hiking trails. Outdoor amphitheater, boat storage, fishing, and kayaking. Courts for tennis, bocce, and pickleball are also available. Four Seasons at the Lakes is a gated community with slightly larger homes ranging from 1,320 to 3,494 square feet. Floor plans have 2-4 bedrooms, 2-3 baths, and 1-2 car garages. If you’re looking for active retirement communities that are smaller and more intimate than the large scale Del Webbs, Marrington at Cobblestone is a good option to consider. With 98 planned homes and 21 acres bordered by woodlands and wetlands, Marrington at Cobblestone might be a good fit. You’ll find both new construction and resales here. Floor plans for these single family and attached homes range from 1,171 to 1995 sq ft, 2-3 beds, and 2-3 baths. Some homes come with 1-2.5 car garages. Amenities include an outdoor pool with sun deck and a club house that has been designed as a social center of the neighborhood. It offers a fitness center, a catering kitchen, and a flex room that can be used for social events and club meetings. In price ranges that are $500K and over, buyers can opt for Mt. Pleasant’s only active retirement community. Liberty Cottages was designed to give retirees a low maintenance lifestyle where they can still have the freedom of living in a house with as-needed services. An exclusive agreement with the Somerby assisted living center (located nearby in Mount Pleasant) provides residents with optional care options such as priority admission access, transportation, laundry, in-home physician care, housekeeping, transportation services, and more. This subsection of Park West offers only 43 single family home sites. Two story floor plans have a ground floor master suite with the main living area, and the second floor is made up of guest rooms and storage. Sizes range from 2,746 to 3,143 sq ft. Residents in Liberty Cottages can access all of the amenities at Park West including walking trails, tennis courts, and 2 pools (1 is designated for adults only). With a goal of only 109 homes, Pines at Gahagan is another more intimately scaled 55+ active lifestyle community in Summerville. This gated neighborhood was established in 2006, and you’ll find both resale and brand new homes for sale in its final phase. Buyers tend to like the central location in Summerville and also the homes’ brick exteriors (shown right). These one story layouts have been designed with no stairs and wide doorways for easy access throughout. You’ll find 2-3 bedroom residences ranging from 1,500 to 3,000 sq ft. Pines at Gahagan offers resort style amenities including an outdoor pool and a 4,700 foot club house offering fitness center with lockers, catering kitchen, juice bar, and flex room for events. Once the builder has finished the final phase, Pines at Gahagan plans to turn the builder spaces into a library, craft room, and billiards hall. Active adults looking for an affordable home closer in to historic Charleston should certainly consider the Elms of Charleston. Two hundred acres and over 300 homes put this age restricted community in between the smaller neighborhoods like Pines at Gahagan and Marrington and large scale developments like Cane Bay. Most of the residences in Elms of Charleston have 2-3 bedrooms and 2 full baths and range from 832 to 2,096 feet. Resale homes date back to 1987, and you’ll also find newly constructed houses. The most affordable options are attached with a single story townhouse setup. A full time Activities Director oversees trips and social events, and an 8,000 sq ft club house boasts a variety of activities. You’ll find a fitness room, lounge, pool table, library, 3 shuffleboard courts, lawn croquet, tennis court, and an outdoor pool. 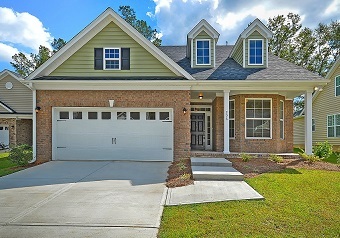 The Ponds is one of Summerville’s newest neighborhoods, and you’ll find 2 sections dedicated to buyers aged 55 or better. The first is Carillon, and it boasts 56 pre-owned homes in a gated section. Homeowners can enjoy the 1,100 acre preserve and 21 miles of nature trails within The Ponds. Few communities in Charleston have designated this type of space for preservation, so these unspoiled woodlands are quite unique. 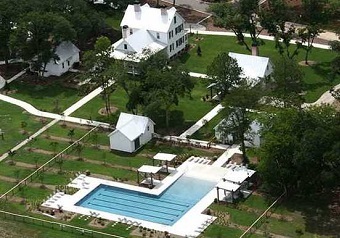 The Ponds hosts concerts at its amphitheater overlooking the lake and boasts impressive amenities such as a saltwater pool, 4,000 foot Farmhouse with hobby and game rooms, muscadine field, and fishing lakes. Carillon residents can access the amenities at The Ponds that are open to all residents, so know that these amenities will be shared with non-retirees. Some buyers enjoy this appeal since it gives them the retirement feel with Carillon neighbors but doesn’t separate them completely from residents aged 55+. However, other buyers looking for true 55 and over communities find the mixed amenities a drawback for Carillon. Cresswind is the second subsection of The Ponds dedicated to residents aged 55 plus. 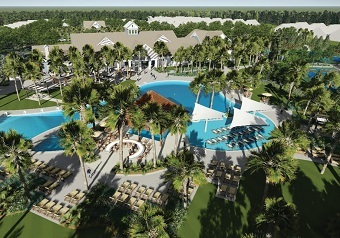 Cresswind buyers also have access to all of the amenities stated above. Here, you’ll find resales dating back to 2015 in addition to homes that are brand new construction. When it’s completed, Cresswind at The Ponds will have 600 homes (making it a sizable age restricted community). Homes range from 1,454 to more than 2,500 square feet and have at least 2 bedrooms, 2.5 baths, and a 2 car garage that’s attached. Historic Charleston is about a 30 minute drive, and the International Airport is about 20 minutes. If you’re interested in learning how to eliminate your monthly mortgage payments, ask us about reverse mortgages!